Lux is helping to support important new funding opportunities in Ocean Sustainability and in Disaster Risk, Reduction, and Resilience. 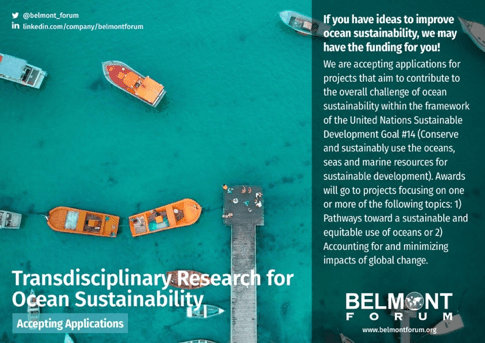 These are collaborative research actions run by the Belmont Forum, which is an international consortium of 28 funding agencies on six continents, supporting international and transdisciplinary environmental change and sustainability research. The Belmont Forum’s work aligns nicely with our own mission at Lux: to improve the impact of social and scientific programs. We are using our Grant Operations system – the “GO” system – to receive and peer review the applications. Back in December, Lux attended the American Geophysical Union (AGU) conference in Washington, DC to provide outreach support for the Belmont Forum. Approximately 28,000 scientists from around the world attended “#AGU18.” This was a great opportunity for us to promote the new funding opportunities. Lux developed postcards and banners to capture the attention of participants and tell the Belmont Forum story. We signed many attendees up to the Belmont Forum email lists. For several years, Lux has supported the Belmont Forum with Training, Technical Assistance, Monitoring, Evaluation, & Learning (TTA MEL). Please visit our TTA MEL page to learn more about our services. Check out the Belmont Forum website and sign up for updates and announcements for Belmont Forum grant opportunities! 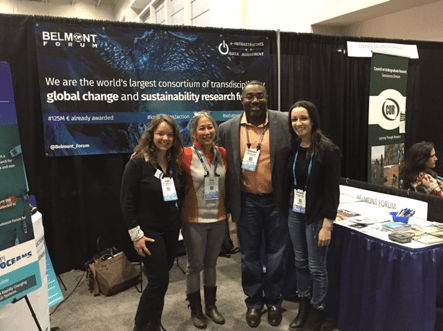 Lux President, Leonard Boyd at the Belmont Forum exhibit with Judit Ungvari Martin (AAAS Fellow), Tina Lee (Belmont Forum e-Infrastructures), and Amanda Hoffman (Lux). Front of postcard designed by Lux to promote the Belmont Forum Ocean Sustainability Call for Proposals.